the desire to create something daring; a culinary-inspired line of Bloody Mary mixers that could bring a level of sophistication to an otherwise stale category. But to create something bold, we knew we needed to have a different mindset in crafting these mixers, a perspective, we felt, only a chef with impeccable taste could bring to the team. 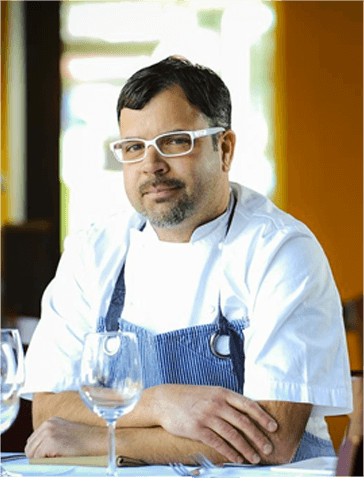 Enter nationally-renowned Chef Anthony Lamas, Head Chef, and Owner of Seviche Restaurant in Louisville, Kentucky. Chef Lamas’ passion for exploring the unexpected, and pairing contrasting styles and flavors has helped him capture the taste buds of patrons across the country. His unique approach to his craft and focus on ingredient-based solutions to complex culinary problems made him the perfect partner as we began building four distinct flavor profiles for this new Bloody Mary line. After countless hours of experimentation, an endless number of recipe variations, and more taste-testing than you can imagine, we settled on a full line of top-quality Bloody Mary mixers. The results stay true to the history of the Bloody Mary while reflecting Chef Lamas’ personal passion for layering complex flavors and dedication to the use of top-notch, chef-quality ingredients. When we get asked “what’s in a Bloody Mary?”, we can’t help but smile, because, with Bold Flavor Adventure, we know the possibilities are truly endless. So take a risk, step outside the box, and come experience a full-sensory adventure with Master of Mixes Bold Flavor Bloody Mary Mixers!